Click Here To See Cover Art With Acetate Overlay Lifted Up! Click Here To See The Amazing Spider-Man #132 Comic Book! Check out this stunning OVERSIZED Amazing Spider-Man cover which was penciled by the great Gil Kane, AND penciled and inked by the great John Romita, from the story titled: "The Molten Man Strikes Again!" 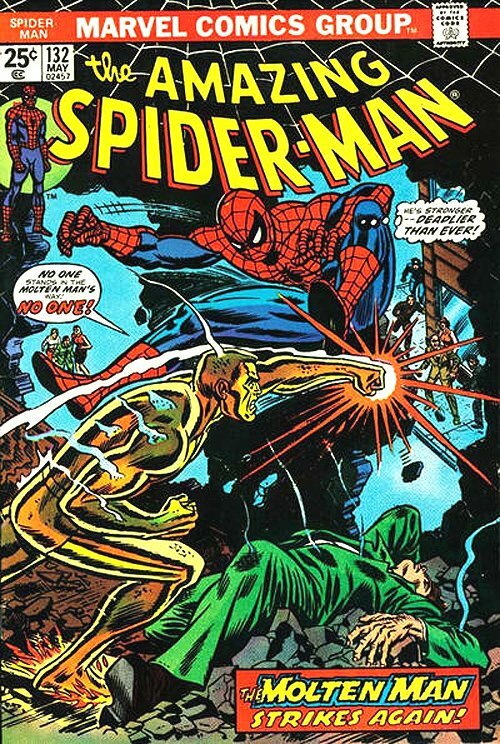 This stunning cover features the VERY FIRST time that John Romita and Gil Kane ever drew the Molten Man, as he last appeared during the STEVE DITKO run on ASM with Amazing Spider-Man #35 in 1965! The Spider-Man and Knocked out Flash Thompson figures were penciled by Gil Kane on board... EVERYTHING ELSE you see on this cover was penciled by John Romita, with the entire cover being inked by the great JOHN ROMITA as well! This cover was drawn with a combination of art on board with a vellum background on board. 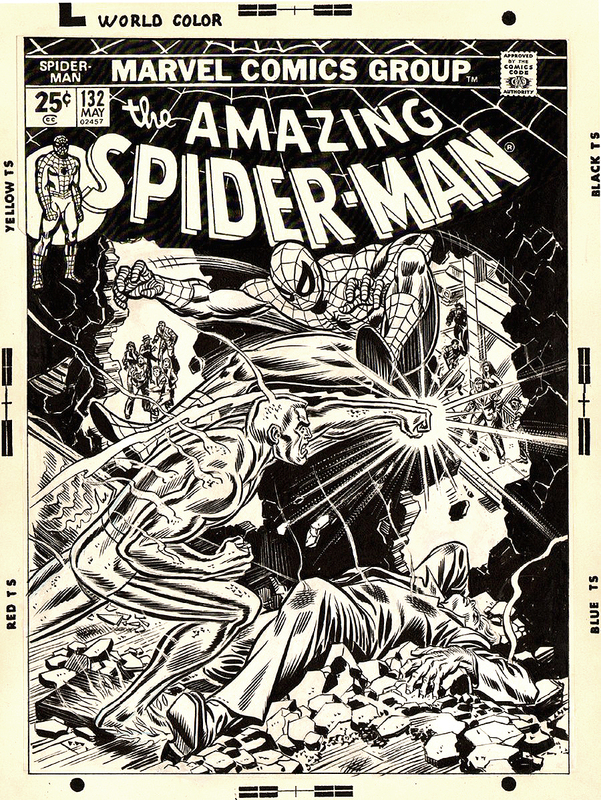 THIS cover is the SINGLE LARGEST DRAWN Amazing Spider-man cover post 1967! The actual top of logo to bottom of drawn cover area measures 11.8 by 16.3 inches tall on a 13.3 by 18.2 inch art board. The logo and word balloons were all reconstructed and match the artwork perfectly. The logo was glued professionally down onto the artwork, and the word balloons were all placed onto an acetate overlay which nicely shows ALL of the great drawn artwork underneath. Also... the image of the people and bricks by Spidey's right hand where the building opening is, was originally drawn with many more people shown behind it...this drawn scene can also be seen when the acetate overlay is lifted up. Click the extra red link above to see how STUNNING this cover looks when the acetate overlay is lifted up, to show all of this amazing drawn artwork! Just a great cover here! If you want one of the most detailed...stunning, and by far the "LARGEST" post 1967 Amazing Spider-Man cover ever drawn..... This one right here is for YOU! 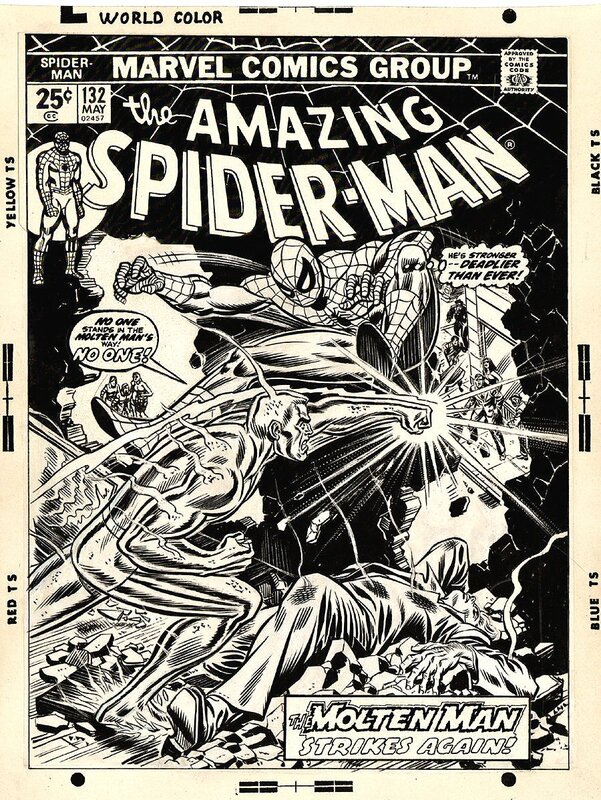 The Small art 1975 Gil Kane and John Romita Amazing Spider-Man #151 cover just sold for OVER $155,000 recently at auction, so Don't pass on this stunningly detailed, much LARGER ASM all out BATTLE COVER, drawn by the 2 greatest Amazing Spider-Man cover artists after Steve Ditko! Compare this nice cover art to the published comic book in the red link above! ALL art on our website (including this one) are able to be purchased with VERY fair time payments, and trades are always considered towards "ANY" art on our website! Just send us an email to mikeburkey@aol.com and we can try to work something out.